You just got a new baby kitten. It’s so cute and playful, and you want nothing more than to let your furry friend to feel right at home. So here are five kitten hacks that are going to help you do just that! Pay attention to your kitten when it starts meowing. Although a kitten meows to ask for different things, It usually means he’s hungry. Don’t let your kitten wait for too long. Make sure you keep a regular feeding schedule that ensures that your kitten is being well fed. Keep in mind, a hungry kitten may be less friendly and demand more attention . A feeding schedule would make your kitten safe and comfortable. Another thing to consider is that a hungry kitten may attempt to eat things that aren’t food! Kittens love chewing around flowers and other plants. It’s good practice to ensure that your house does not contain any seeds or flowers that have been treated with chemicals and remove any toxic plants from the environment. A regular feeding schedule will keep your kitten from ingesting things that may be toxic. Everyone appreciates having their own little place. Your kitten is no different. They love having a comfortable place that is there own little kingdom. Make a comfortable room in your house that your kitten can claim for it’s own. A secluded place with minimal disturbance is best. Having their own space provides them with a sense of security and independence. A good spot for your kitten can be in an elevated position where it can feel secure while observing its surroundings. Kittens love to observe the great outdoors. Having cat shelves or perches are highly recommended. If it’s a sunny day out, you can leave the windows open for your kitten to get some fresh air along with a pretty view. Just make sure that your windows are securely screened so that your kitten won’t jump or fall. If you can’t provide your cat with a window view, try a television. The internet is full with cat videos that would keep your kitten engaged while you’re not home. You should also consider expanding the space your kitten has to roam! 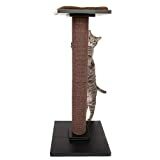 If you live in a small apartment, you can explore vertical space by giving your cat a cat tree to climb on! Cats are tidy little creatures and having dirty surroundings could make them uncomfortable. Cleaning their litter box regularly is key. You’ll also want to put away any loose items that are sitting on counter tops and tables. Cats will instinctively bat at objects to see if they move. This is a left over hunting instinct. Sometimes mice play dead, and cats have evolved to bat at dead mice to make sure they’re really dead. Prepare to see your cat do this with your pens, lipstick, loose change… Pretty much anything you have lying around. More than anything kittens just need to be loved. They are friendly loving creatures and like nothing more than to have one-on-one time with you. If you feel that your kitten still needs some outdoor time, provide it to him in a safe and secure manner. Leash training is best to start at a young age. It might be stressful at first, but once your kitten gets used to the leash it’s quite simple especially if you use a designated cat harnesses. A new kitten is a one of the best presents you can get for yourself. Whether you buy your kitten from a cat breeder or adopt one from a shelter, I hope you’ll find these tips helpful as they were for me and my two brothers! This was a guest post from Pedro (pictured), Editor-in-Chief of wwwallaboutcats.com. Click over there and show Pedro and his family some love! And make sure to like their Facebook Page!